Last season, the Ohio State women’s basketball team averaged 85 points per game. As it looks ahead to the 2018-19 season, only 6.5 of those points will be returning to the roster. Having lost one of the greatest basketball players ever to don a scarlet and gray uniform in Kelsey Mitchell and three other regular starters for the Buckeyes, Ohio State had already been gutted of enough of its roster. On Tuesday, that escalated further when Rutgers announced that Ohio State redshirt senior guard Sierra Calhoun — the only remaining starter from last season — would be heading east to wear a new kind of scarlet as a graduate transfer. During the 2017-18 season, Calhoun was fourth on the team with an average of 11.6 minutes per game. She also was the team’s second-best 3-point shooter among the starters, having made 77-of-215 shots for a 35.8 percent success rate. She started all 35 games with Mitchell, forward Stephanie Mavunga and guard Linnae Harper. Guard Asia Doss started in 30 games, but forward Alexa Hart filled in for the other five due to an ankle injury to Doss late in the year. Calhoun’s departure leaves Ohio State without much of any experience to turn to from the prior season. Redshirt senior Makayla Waterman is the only returning player to have averaged more than 10 minutes over the course of the season. The 6-foot-2 forward averaged 3.5 points, 3.9 rebounds and 1.4 assists per game. The top returning guard and the player with an inside shot at cracking the starting five is former five-star recruit Jensen Caretti, who averaged 8.7 minutes, 2.4 points and 0.6 assists per game in her freshman campaign with Ohio State. This means Ohio State’s lineup, expectedly, will take on a completely different look. The Buckeyes will have unfamiliar players at guard, but the team still has a plethora of other options. 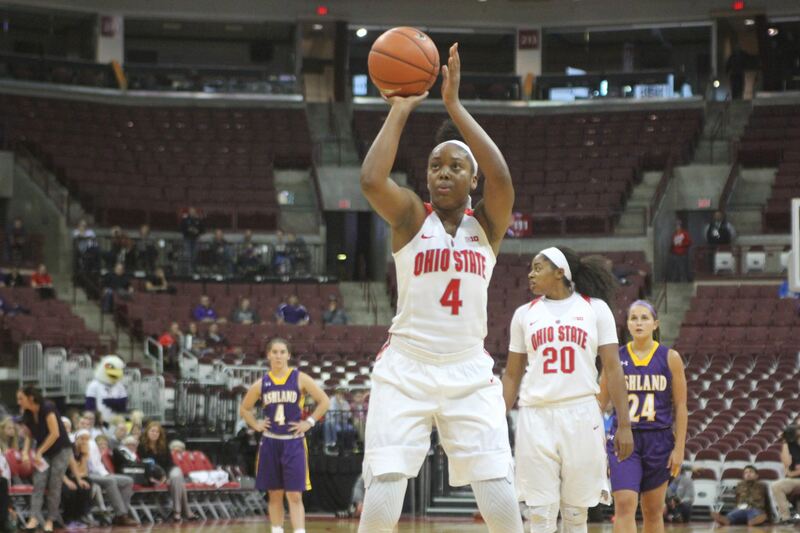 Ohio State received five graduate transfers, all of whom were guards for their former schools: Adreana Miller from La Salle, Najah Queenland from Pacific, Carly Santoro from Bowling Green, Ashanti Abshaw from Cleveland State and Carmen Grande from Bowling Green. It also added four-star guard recruit Janai Crooms, who is listed as the No. 62 overall recruit by ESPN. Grande, who has compiled the second-most assists in the country over the past three seasons, could be counted on to become one of the team’s top ball-handlers while Abshaw leaves the Vikings having become the third-fastest player in school history to reach 1,000 points. That guard depth could be tested by an Ohio State team that has traditionally used four starters at guard as opposed to a more traditional three- or two-guard lineup. Last season, head coach Kevin McGuff started four guards in 30 of the team’s 35 total games. That could again be the case in 2018-19 given the team’s lack of forward depth. Outside of Waterman, Ohio State will have only three-star freshman Aaliyah Patty, four-star freshman Dorka Juhasz and former walk-on Savitha Jayaraman at forward. Patty is listed as the No. 17 overall forward in the 2018 class according to ESPN, while Prospects Nation lists Juhasz as the No. 12 overall international prospect coming to the U.S. to play in 2018. This season will be a trial by fire for most of Ohio State’s roster. Now with Calhoun leaving, the Buckeyes face the prospect of putting out a team with little to no existing chemistry, relying on a roster that returns four players in total and sees nine new players entering the fold. Finding another Mitchell will be difficult if not impossible for McGuff in this this new-look roster. But, he will hope to find a group that can at least come close to the 85 points of last season.